During the fifth century BCE, the Golden Age of Athens, new forms of art and literature were being developed with extraordinary speed and energy. Classical Greek author Sophocles, along with Aeschylus and Euripides, was a primary innovator of the new genre of tragedy, shaping stage conventions that have become central to dramatic art. Sophocles' ability to blend irony and poetry with effective dramatic technique has earned him a reputation as the greatest playwright of world literature. Prize Winner at the Greater Dionysia. When Sophocles completed his education, he competed in the dramatic festival the Greater Dionysia, held every spring for five days. During the time of the festival, all business stopped in Athens, and everyone was invited to participate, even prisoners, who were freed to participate. At the festival of 468 BCE, Sophocles defeated Aeschylus, winning first prize. Sophocles went on to win first prize more than twenty times, never receiving anything below second prize, a unique feat among Greek dramatists. Elite Athenian. As a member of the Athenian elite at a time when Athens enjoyed extraordinary cultural and political supremacy, Sophocles held important political positions. He held the post of treasurer (Hellenotamias) in either 443 or 442 BCE, and served as general along with Pericles (a prominent Athenian general, statesman, and orator) in the war to suppress a revolution in Samos from 441 to 439 BCE. (Samos had been occupied by Athenians in 441 BCE.) Sophocles was also made a member of the Athenian senate. In addition to his political appointments, Sophocles showed his devotion to traditional religion by serving as a priest of the healing deity Amynos. Debatable Dates. 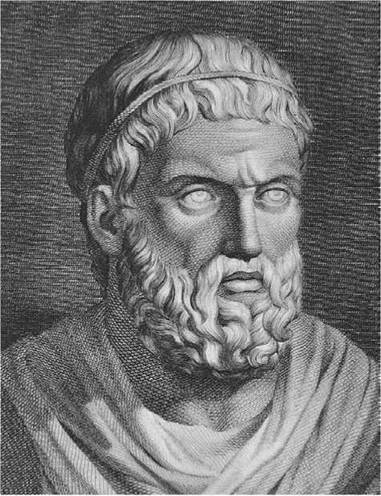 It is estimated that Sophocles wrote some 123 plays. Titles and fragments of ninety exist, but only seven tragedies survive in their entirety. Of these seven, there is a only one that is firmly dated, Philoctetes, in 409 BCE. Oedipus at Colonus is known to have been Sophocles’ last creation because it was produced posthumously in 401 BCE. There are grounds for placing Antigone close to 441BCE. The date of Women of Trachis, a play whose authenticity has been doubted by a few in the past, is now generally put at sometime before Antigone. Ajax is also deemed to be relatively early: 450 BCE. The date of Oedipus Rex has been endlessly discussed without an agreement being reached; stylistically it seems not far from Electra, whose placing on the chronological table is uncertain as to whether it precedes or follows Euripides’ Electra, written in 413 BCE. It appears, then, that of the seven surviving plays, the ones deemed to be ‘‘early’’ belong to a time when the poet was already in his fifties; and some of his finest choral writing, in Oedipus at Colonus, belongs to a man of ninety. Sophocles died c. 406 BCE, in Athens, Greece, though the details surrounding his death are vague. Aeschylus (525?-426? BCE): This contemporary of Sophocles is perhaps best known for his play Agamemnon (c. 458 BCE). Pericles (495-429 BCE): This popular Greek statesman was a leader during Athens's Golden Age. Euripides (480-406 BCE): This Greek playwright wrote Medea (c. 431 BCE) and his own version of Electra (c. 413 BCE). Aristophanes (456-386 BCE): Known as the father of comedy, this playwright's best known work is Lysistrata (c. 410 BCE). Among Sophocles known influences were Greek mythology as interpreted and shaped by poets such as Homer as well as Aeschylus—the author of such plays as The Persians (472 BCE)—who was twenty-eight years older than Sophocles but also Sophocles’ rival during his early years as a writer. Like Aeschylus, Sophocles was affected by the flowering of Athenian culture and the related intellectual life. In addition, the military conflicts with the Persians and with Sparta influenced the work of Sophocles. Technical Innovations. The extraordinary dramatic and poetic power of Sophocles’ tragedies stems, in part, from certain technical innovations that he introduced into the Athenian theater. Unlike Aeschylus, whose dramatic trilogies provide plot continuity and share characters, Sophocles focuses on individual tragedies. By limiting his narrative scope, he achieved a more concentrated emotional intensity and action. In addition, Sophocles enhanced the usually bare Greek stage with skenographia, or scene painting, and more expressive masks, thereby bringing greater realism to each scene. Perhaps Sophocles’ most important innovation was the introduction of the use of a third actor. Traditionally, two actors (all roles were played by male actors), along with the chorus, participated in the epeisodia, or episodes, of the play. The addition of the third actor enabled Sophocles to construct a more complex dialogue, thereby keeping the focus on the characters rather than on the chorus. He increased the chorus from twelve to fifteen members and, while limiting its participation in the action, composed some of his most beautiful poetry for it. Many commentators have praised the imaginative form, striking imagery, and emotional power of Sophocles’ choral songs, with particular attention to their poetical and philosophical content. Sophocles’ dramatic style is often described as a divine union of strength and control. In measured, simple, and piercingly direct language, Sophocles’ dramas move swiftly, logically, and inexorably toward their seemingly inevitable conclusions. The most painful human situations—utter personal humiliation, the accidental murder of a loved one, a cataclysmic reversal of one’s station in life—are presented in a manner that implies compassion for the suffering individual but also places personal misfortune in a universal, cosmic context. Free Will. The hallmark of Sophocles’ style is his gift for portraying exceptional characters under stress. His dramas are built around a strong-willed, highly principled character who encounters a seemingly insurmountable ethical or moral difficulty. For Sophocles, the center of interest was the individual human being who will not compromise even when he or she clearly perceives the advantages that compromise would bring. Sophocles creates characters of heroic proportions, yet these heroic qualities often lead to disaster. By creating characters who refuse to compromise, Sophocles sows the seeds of a person’s own destruction. At the same time, such a character is plainly the kind that he admires and for whom he seems to invite admiration by others. In this respect, his emphasis is on human free will. The hero has only to change his mind, to adapt to circumstances, and catastrophe will be averted. Prophecy. There is another counter-theme running through six of the seven tragedies: the theme of oracular predictions and the inevitability of their fulfillment. Though the extent of their participation in human affairs remains unclear, the gods are respected and feared in the world of Sophocles’ plays. Oracles are consulted and heeded. This tension between human free will and divine predestination presents problems of interpretation. Artistically the interest revolves around a person’s own free decision, but the development of the plot leaves no doubt as to the outcome. Influences. Sophocles is regarded as the pinnacle of Greek dramatic art and one of the greatest dramatists in Western literature. The stage conventions that he helped initiate have become central to dramatic art, and he is acknowledged as one of the shapers of the genre. Sophocles’ plays and innovations have also profoundly influenced the development of European literature. Alcestis (438 BCE), a play by Euripides. In this play, the title character, who has sentenced herself to death, is revived at the last minute by the hero Heracles. The Winter's Tale (1623), a play by William Shakespeare. At the end of this play, a statue magically comes to life and reveals itself as the previously dead character Hermione. The War of the Worlds (1898), a novel by H. G. Wells. The terrible alien invasion in this novel ends abruptly when the Martians all catch a cold and die. Donnie Darko (2001), a film by Richard Kelly. In this movie, the title character's problems appear to be solved when a plane crashes into his bedroom. Sophocles is considered one of the greatest dramatists in Western literature. His surviving tragedies attest to his consummate craftsmanship in plot construction, characterization, and versification. In fact, critics acknowledge him as one of the shapers of dramatic art. His reputation as a dramatist has been secure ever since his own time. Sophocles’ technical skill as a dramatist, unforgettable characters, and haunting, perfectly plotted plays, have secured his standing in world literature. Oedipus Rex. Of all Sophocles’ plays, Oedipus Rex—a tragedy denied first prize either because it was ahead of its time or because of the vagaries of the Athenian voting system at the dramatic festival—is at once his least typical play and the one that has left the deepest imprint. Perhaps the most famous play ever written, Oedipus Rex describes the tragic events that lead Oedipus to murder his father and marry his mother, unaware of their true identities. In Poetics (c. 335 BCE), Aristotle plainly regarded the play as the greatest masterpiece of the genre, claiming it was a model tragedy, containing Sophoclean elements such as reversal and discovery. Despite such problems, Oedipus Rex has received considerable attention in modern times, partly due to the father of modern psychiatry, Sigmund Freud. Freud was tremendously moved by the play and popularized the notion of the Oedipus Complex. While critics still agree that the play is a gripping exploration of the role of the gods in a man’s life and a warning to man to avoid becoming too proud, some critics have focused their attention on the play’s themes, the playwright’s use of irony, the function of the chorus, and the Freudian interpretation, among other issues. 1. Using a Venn diagram, compare and contrast Electra with her sister Chrysothemis and their actions and motivations in the play Electra. 2. In a group discussion, explain the roles of fate and free will in Sophocles’ plays. 3. Write a brief report explaining why you think Oedipus Rex is considered Sophocles’ masterpiece. 4. Research Sigmund Freud’s Oedipus and Electra complexes. Are these terms fair to Sophocles’ characters? Write an essay about your conclusions. 5. In small groups, create alternative ways in which you could solve Antigone’s problems without using a deus ex machina. Bowra, C. M. Sophoclean Tragedy. Oxford: Oxford University Press, 1944. Dawe, R. D., ed. Sophocles, the Classical Heritage. New York: Garland, 1996. Jebb, R. C. Oedipus Tyrannus. 3rd ed. Cambridge: Cambridge University Press, 1893. ________. Trachiniae. Cambridge: Cambridge University Press, 1892. Kirkwood, G. M., A Study of Sophoclean Drama. Ithaca, N.Y.: Cornell University Press, 1958. Knox, B. M. W. The Heroic Temper: Studies in Sophoclean Tragedy. Berkeley: University of California Press, 1964. Lesky, Albin. Greek Tragic Poetry. New Haven, Conn.: Yale University Press, 1983.
Letters, F. J. H. ‘‘The Oedipus Tyrannus’ In The Life and Work of Sophocles. London: Sheed and Ward, 1953. Waldock, A. J. A. Sophocles, the Dramatist. Cambridge: Cambridge University Press, 1951. Winnington-Ingram, R. P. Sophocles: An Interpretation. Cambridge: Cambridge University Press, 1980.